Featuring in a TLC TV series called Family by the Ton, Casey said: “I will just eat until I am dead, probably. 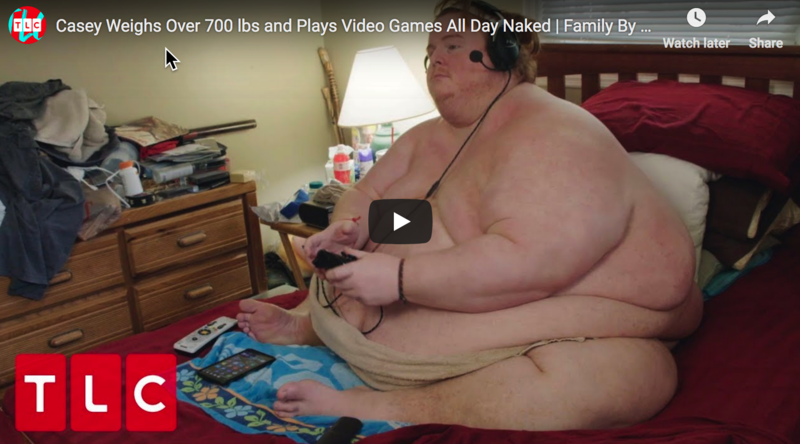 Because of the hot weather in Georgia he prefers to skip clothes, wearing only a headset through which he uses to chat to other gamers playing online. It is easy to criticize Casey for his lack of activity, but he is really not too different from most other Americans. As I have written about before, the average American spends approximately five hours a day watching television. We are willingly plugging ourselves into “the propaganda matrix” for thousands upon thousands of hours, and of course that is going to greatly affect our outlook on life and how we see the world. ‘It’s hot in Georgia, and all my clothing is restricting and tight, so I just sit there naked, free as can be and no one bothers me — door’s shut, we’re good,’ he explained. The gaming community has become a safe space for him because it allows him to escape his everyday life. The only reason why Casey is able to live this kind of lifestyle is because his father takes care of him and pays all the bills. And on a much grander scale, isn’t this what our country is turning into? 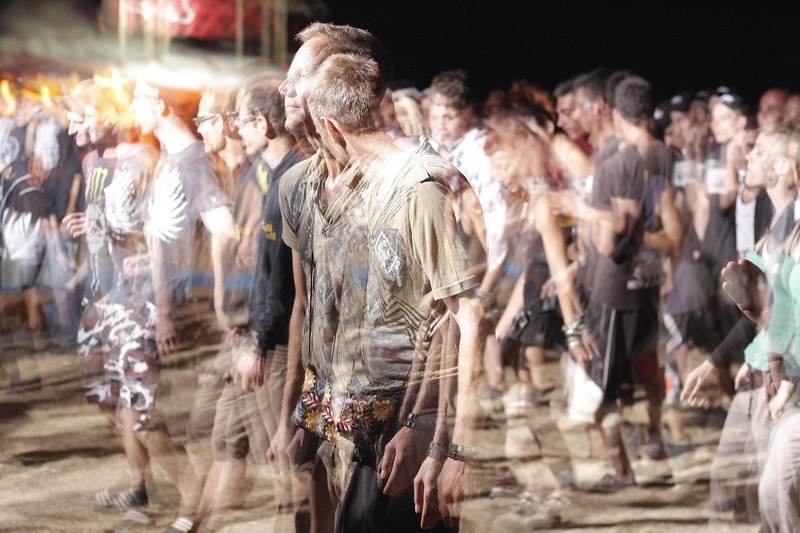 Young adults are flocking to socialist ideas because they want the nanny state to take care of them from the cradle to the grave and give them everything for free. ‘I never would’ve thought at 34 I’d be living with my father, and I’d have no job, have no real money, and just be playing video games all day and eating,’ he said. It would be really easy to look down on Casey, but the truth is that our nation is just like him in so many ways. At this point, we are a nation that completely lacks self-discipline. Obesity is at an all-time high in the United States, millions of us are addicted to legal and illegal drugs, we have one of the highest rates of alcoholism on the planet, 37 percent of all Americans have eaten fast food within the last 24 hours, and the CDC says that 110 million Americans currently have a sexually-transmitted disease. But when I first learned about Casey, I didn’t think about any of those things. Instead, I thought about our exploding mountain of debt. Like Casey, we just can’t stop ourselves from going back for more. We have been on the greatest debt binge in the history of the world, but our hunger just keeps growing. In just a matter of days, the U.S. national debt will hit the 22 trillion dollar mark, but nobody in Washington seems to care. But if you were to sit down and talk with most of our politicians, they would ultimately admit that all of this debt is an existential threat to our nation. It is just that they completely lack the willpower to do anything about it. We know that what we are doing is definitely going to kill us, but we are not willing to change. Meanwhile, state and local government debt levels are at record highs, public and private pensions are unfunded by trillions upon trillions of dollars, corporate debt has doubled since the last financial crisis, auto loan debt is at an all-time high, credit card debt is absolutely soaring, and student loan debt has roughly tripled over the last decade. So please don’t be too critical of Casey, because the truth is that he would make a perfect poster boy for what we have become as a nation. When people point to a modestly good short-term economic number as some sort of “victory”, I just laugh, because the truth is that all of those numbers are fueled by record amounts of debt. During 2018, we added close to 1.4 trillion dollars to our national debt. If all of that money was pulled out of the economy and we had only been spending what we had been bringing in, we would be in the worst depression in American history right now. The only way we can maintain our economic facade is by endlessly gorging ourselves on debt, but in the process we are literally destroying the bright future that our children and our grandchildren were supposed to have. In the final analysis, what we are doing to ourselves as a nation makes Casey King look like a sharp, disciplined, athletic young man in comparison. If we keep doing this to ourselves, we have no future, and nobody can argue with that. And the IMF report also seemed to indicate that global central banks were responsible for the situation in which we now find ourselves. The IMF Global Financial Stability report read: “The extended period of ultralow interest rates in advanced economies has contributed to the build-up of financial vulnerabilities. This is extremely unusual language for a globalist institution such as the IMF to be using. Are they trying to signal that a major global financial crisis is imminent? Of course they would hardly be the first to sound the alarm. Prominent names throughout the financial world are making all sorts of ominous declarations these days, and more red flags continue to pop up with each passing day. A stronger US dollar and the global cost of capital rising is the perfect cocktail, in our opinion, for a liquidity crunch. Major liquidity crunches often occur when yield curves around the world flatten or invert. 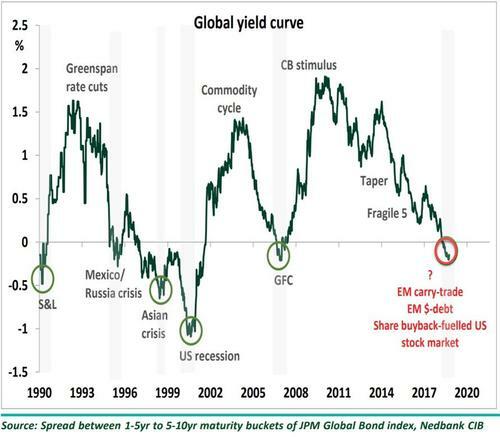 Currently, the global yield curve is inverted; this is an ominous sign for the global economy and financial markets, especially overvalued stocks markets like the US. To me, that is one of the most alarming charts that we have seen in a very long time. Everything in the global financial system revolves around the flow of debt. When money is cheap and flowing freely, economic growth tends to expand. But when a liquidity crunch happens, economic activity can start contracting very rapidly, and it looks like that is the type of scenario that is quickly starting to develop. In fact, we are already witnessing a substantial liquidity crunch in emerging markets. Lenders are hesitant to lend while economic conditions in those countries are chaotic, and a rapidly rising dollar has made servicing existing dollar-denominated debts increasingly problematic. As we witnessed in 2008, debt bubbles end when liquidity begins to tighten up. The only way that this current debt bubble can survive is if it continues to expand, and it can only expand for as long as lenders are willing to part with their money easily. If interest rates continue to go higher, the U.S. economy and the global economy as a whole are going to be hit really hard. Stocks fell sharply on Thursday as interest rates hit new multiyear highs, dampening investor sentiment. The Dow Jones Industrial Average dropped 201 points as Nike and Home Depot lagged. The 30-stock index dropped 356 points at its lows of the day and posted its worst decline since Aug. 10. The Dow hit a new all-time high earlier this week, but many believe that it was essentially an illusion. There have been two days since 1965 have seen 3x as many NYSE stocks at year-lows than at year-highs while the Dow traded at an all-time high. The only other time prior to October 3, 2018? December 28, 1999. The Dow was just days prior to hitting 11,722 on January 10, 2000, which would mark its long-term top. It would bottom at 8,062 on September 21, 2001. A 32% decline. The Nasdaq lost over 60% of its value during that same period, and would decline 78% from its all-time high. Sentiment on Wall Street has shifted at a rate that is absolutely breathtaking. The mindless optimism of recent years has been replaced with an ominous feeling that a major downturn is imminent. And because markets tend to go down a lot faster than they go up, a lot of people could end up being wiped out financially before they even realize what just hit them. If we do not change course, our once great nation will be destroyed by a debt that has grown wildly out of control. We are facing an unprecedented debt crisis that literally threatens to bring our country to an end, and yet our politicians are almost entirely silent on this issue in 2018. In fact, Republicans and Democrats just worked together to pass another big, fat spending bill through Congress that is actually going to increase the pace at which we are going into debt. What the Republicrats are doing is not just wrong. To be honest, the truth is that they are committing crimes against humanity, and they are completely wiping out the very bright future that our children and our grandchildren were supposed to have. How in the world is America supposed to be “great again” when we are buried in so much debt that future generations can never have any possible hope of getting free from it? The federal debt increased by $1,271,158,167,126.72 in fiscal 2018, according to data released today by the Treasury. The total federal debt started the fiscal year at $20,244,900,016,053.51 according to the Treasury, and finished the fiscal year at $21,516,058,183,180.23. This is one of the reasons why I wanted to go to Washington. Our current “representatives” are completely and utterly failing us. Once upon a time, at least members of the Tea Party would stand up and say something, but these days nobody seems to care that America’s future is being systematically destroyed. Republicans have been in control of both houses of Congress, but our debt problems just continue to get worse and worse. And the truth is that the budgets that have been passed since Donald Trump became president are simply slightly revised Obama budgets. The Republicans have allowed the Democrats to have their way time after time, and it has been absolutely disgusting to watch. In 8 of the past 11 fiscal years, the U.S. national debt has risen by more than a trillion dollars, and the U.S. national debt is now sitting at an all-time record high of 21.52 trillion dollars. What we are doing is literally insane, and if we want our nation to survive we must change course immediately. These days, there is a lot of discussion about the political gains that “Democratic socialists” have been making all over America, and Republicans are trying to assure us that the American people don’t actually want socialism. We know socialism does not work. It is an economic system based on the use of force rather than economic freedom of choice. But while many Americans seem to be in a panic over the failures of socialism in Venezuela, they don’t seem all that concerned that right here at home President Trump just signed a massive $1.3 trillion dollar spending bill that delivers socialism on a scale that Venezuelans couldn’t even imagine. In fact this one spending bill is three times Venezuela’s entire gross domestic product! Did I miss all the Americans protesting this warfare-welfare state socialism? If you are really against socialism, you should be fighting for the federal government to be greatly reduced in size and scope. But so few Americans seem to believe in true limited government these days. It would be a great first step if we would actually try to start living within our means. But if 1.271 trillion dollars of government spending was pulled out of the economy over the past 12 months, the result would be a horrible economic depression. And politicians do not like economic downturns, because when things get bad voters tend not to vote for incumbents. So they just keep going into more debt and they keep kicking the can down the road. But if we stay on the path that we are currently on, the CBO says that the United States will be 99 trillion dollars in debt by 2048. Of course we will never actually ever get to 99 trillion dollars in debt. America will cease to exist long before we ever reach that mark. If we want to save America, we must take action now, but very few people seem to even care about our exploding debt at this point. If you added up the personal debt of every American — what they owe on their mortgages, credit cards, student loans, and more — the total is staggering. Collectively, we’re $13.2 trillion in the red. That’s the highest ever, according to the New York Fed. Yet no one seems to be panicking. Maybe that’s because we can’t comprehend $13 trillion. Imagine buying every NFL team. And every NBA team. And every NHL team. And every Major League Baseball team. But that only adds up to $191 billion. America is committing suicide in slow-motion, and it is an absolutely heartbreaking thing to witness. Nothing grows forever. Cancer tries, but always defeats itself in the process. Yeast parties until all the sugar in the vat is gone or it pollutes itself out of an active existence. Can humans do better? The jury is still out on that. But so far, the signs say that, as a group, we lack the ability to organize effectively against big, complex challenges. Especially if doing so requires us to willingly choose to live a life of less. We’re simply too addicted to more. We cannot continue to go down this road. Because at the end of this road is not just economic collapse. What we are talking about is literally the end of the United States of America. All throughout history, great societies have been done in by greed, sloth, corruption and laziness, and we are headed down the exact same path. If we want to survive, emergency surgery is necessary, but at this point nobody is even tending to the dying patient. According to the latest estimates released by Edmunds, new vehicle sales for September are expected to collapse both on a monthly basis and year-over-year basis. The company predicted that 1,392,434 new cars and trucks will be sold in the U.S. in September, which makes for a estimated seasonally adjusted annual rate (SAAR) of 17 million. This will be a 5.4% decrease from last month and an 8.3% drop from September of last year. Those are absolutely terrible numbers. The drop in sales capped another rough month for the auto industry during which Detroit’s carmakers all revised their earnings guidance lower and Ford embarked on a five-year restructuring plan. Earlier this week, we reported that Ford’s CEO claimed that President Trump’s auto tariffs had cost the company $1 billion in profits. Sadly, this may just be the very beginning of the auto industry’s troubles. Retaliation by China to tariffs already in place have made some American auto exports uncompetitive, and could collapse US auto sales by 2 million vehicles per year, resulting in the loss of up to 715,000 American jobs and a devastating hit of as much as $62 billion to the US GDP. As per NBC News, the Center for Automotive Research (CAR) warns that the auto industry could receive a devastating blow if Section 232 declares foreign-made cars and car parts a threat to national security. Kristin Dziczek, a vice president and senior economist at CAR, said if Section 232 is enacted, it could trigger a “downward cycle” in the auto industry – not seen since the last great recession. And needless to say, the thousands of companies that do business with those large automakers would also lose sales and jobs. Once these downturns get rolling, the domino effect can be absolutely devastating. If the U.S. economy truly is “strong”, then why have we seen four monthly declines in a row? As Bloomberg notes, the decline, which was broad-based across all four regions, shows that higher mortgage rates, rising prices and a shortage of affordable homes continue to squeeze buyers. Existing-home sales in August matched the lowest in more than two years, while revisions to new-home sales showed a slower market than thought, according to previously released figures. Homes are not selling like they once were. There is a reason why one out of every four home sellers in America slashed their prices in August. Demand is way down, and that strongly indicates that an economic slowdown is here. Central banks have emerged as some of the biggest buyers of gold this year, buying a total of 264 metric tons this year to reach the highest level in six years, according to analysts at Macquarie. Of course the Federal Reserve and other central banks are trying to assure us that everything is going to be okay, but meanwhile their actions are telling us a different story. Much of the world is already in the midst of a crippling economic crisis, and every indicator seems to be pointing to the fact that the U.S. is headed down the same path. Even without any extenuating circumstances, the truth is that we are way overdue for a recession. But when you throw in political chaos, exploding debt levels, an emerging market currency crisis and a trade war between the two largest economies on the entire planet, you definitely have a recipe for a perfect storm. Folks, it’s not a “skirmish”. On the scale of trade warfare we are now at DEFCON 2. At this very moment, the US is taxing $250 billion of Chinese imports or nearly half the total flow; and China is taxing $110 billion of its imports from the US or 85% of the flow. And it’s soon going full monte. The Donald has repeatedly threatened to tariff the remaining $267 billion of Chinese imports if Beijing retaliates against his $200 billion, but, self-evidently, they already have. The U.S. economy has found a way to muddle through for the past couple of years, and we should all hope that the economy can find a way to navigate through these current problems. But the storm clouds are growing more ominous with each passing day, and at some point time will run out. Temporary prosperity that is created by exploding levels of debt is not actually prosperity at all. At this moment, the U.S. government is 21.4 trillion dollars in debt, and we have been adding an average of more than a trillion dollars a year to that debt since 2009. And if we stay on the path that we are currently on, the trajectory of our debt will soon accelerate dramatically. In fact, as you will see below, the Congressional Budget Office is now projecting that the U.S. national debt will reach 99 trillion dollars by 2048 if nothing changes. Congressional Budget Office projections always tend to be overly optimistic, and so the reality will probably be much worse than that. Of course we will never actually see the day when our national debt reaches 99 trillion dollars. Our government (and our entire society along with it) will collapse long before we ever get to that point. In our endless greed, we are literally destroying America, and emergency action must be taken immediately if we are to survive. Debt always makes things seem better in the short-term, and it is always destructive in the long-term. When we go into debt as a nation, we are literally stealing from the bright future that our children and our grandchildren were supposed to have. 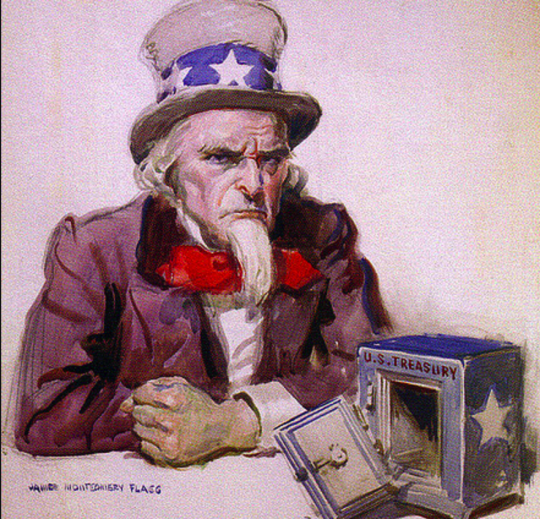 Through the first 11 months of this fiscal year, the official U.S. budget deficit was $895,000,000,000, which means that we continue to steal more than 100 million dollars from future generations of Americans every single hour of every single day. And it is important to remember that not all additions to the national debt are included in the official budget deficit. One year ago, our national debt was sitting at 20.1 trillion dollars, and that means that we have added an astounding 1.3 trillion dollars to the debt over the past 12 months. This is complete and utter insanity, and it must stop now. Let me try to put this into perspective. Not too long ago, Venezuela was once one of the wealthiest countries in South America. These days, many Americans like to laugh at them, but we are on the exact same path that Venezuela has gone down. Eventually, the day comes when there is not enough of someone else’s money to spend, and suffocating levels of debt make the option of printing giant mountains of money too tempting to resist. At that point it is just a matter of time before the currency is destroyed and society devolves into chaos. Under the new baseline incorporating recent changes in law, the national debt reaches $99 trillion in 2048 — equivalent to 152 percent of GDP. The federal budget deficit is expected to break through a trillion dollars in 2020 and never look back, reaching $2 trillion in 2032 and $6 trillion in 2048. But like I said, we will never actually get there, because our society will collapse by then. 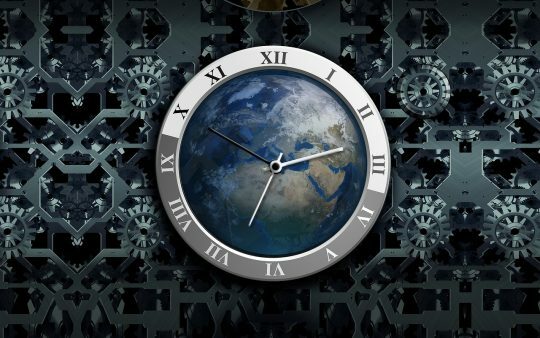 So we only have a limited amount of time to save America, and the clock is ticking. Debt held by the public will top $127,000 per household by the end of the year, according to JPMorgan. Personal debt per household will average about $126,000. I wish that I could get more people to understand just how serious this is. Do you know what the inflation rate will be in Venezuela this year? The IMF is projecting that it will be more than a million percent. Chaos is everywhere, crime is out of control and people are starving, and yet we refuse to learn from what has happened to them. We just keep spending and spending, and we think that we have found the key to prosperity. But what we have really found is an accelerated path to economic hell. Behind the dry official language, the message is clear. A recovery that is based around high and rising levels of debt is really no recovery at all. The world economy is, in all material respects, the same as it was in the run-up to the 2008 crisis. The necessary reforms to a flawed model have not taken place, which is why the BIS warning should not be ignored. On a personal level, have you ever gotten into debt trouble? At first, it was a lot of fun enjoying all of the new things that all of that debt bought, but the pain afterwards greatly outweighed the initial temporary prosperity. And it’s that $20 trillion, built up over the last two decades, that has basically distorted everything – falsified prices, repressed interest rates, caused an explosion of debt. Twenty years ago there was $40 trillion of debt in the world today there is $250 trillion worth of debt in the world. The leverage of the world has gone from 1.3 times which is stable…to 3.3 times, which basically means the world has created a huge temporary prosperity by burying itself in debt. It would take an unprecedented effort to turn things around, but right now hardly anyone seems concerned about bringing all of this debt under control. 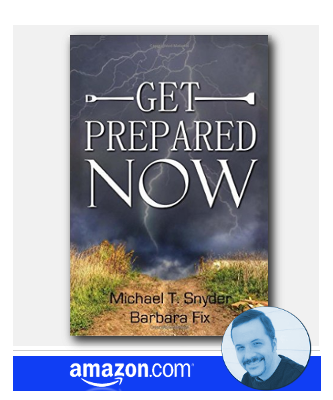 So we continue to roll on toward our date with financial disaster, and most people are completely oblivious to what is about to happen to us. What kind of number for GDP growth in the 2nd quarter will we get on Friday? The market consensus is somewhere around 4 percent, but there are many out there that are expecting a number above 5 percent. The last time we witnessed such a number was during the third quarter of 2014 when the U.S. economy grew by 5.2 percent. If Friday’s GDP figure is better than that, it will be the best report that we have had since 2003. But let’s keep things in perspective. In seven of the last 10 years, GDP growth was much lower than anticipated in the first quarter and much higher than anticipated in the second quarter. It looks like that pattern may play out again in 2018, and analysts are already warning us to expect a much lower number for the third quarter. And even though we have seen good quarters before, we still have not had a full year of 3 percent growth since the middle of the Bush administration. Last year the U.S. economy grew by only 2.3 percent, which would be a horrible figure even if the government was using honest numbers. According to John Williams of shadowstats.com, GDP growth for 2017 would have actually been negative if honest numbers were being used. So let’s not get too excited over one quarter. According to the official government numbers, the U.S. economy has not grown by at least 3 percent on an annual basis in 14 years. That is the longest stretch in all of U.S. history by a wide margin, and it is going to take a really good second half to break that string this year. “You’re going to get a GDP number on Friday that’s going to be a very impressive number. Some people are in the 4 to 5 percent zone,” Larry Kudlow, the White House economic adviser, told CBS This Morning. And he is probably right. In fact, we might see a number that is even better than that. The second-quarter figure will be widely seen as a referendum on the GOP tax cuts of late 2017. This quarter benefits from a timing sweet spot, coming after the deficit-busting cuts trickled through the economy, but before the effects of the White House’s protectionist trade policies are fully felt. If we get a really good number, it may actually be bad news for investors. Ultimately, a reading that comes in too hot could fuel expectations that the Federal Reserve may need to ramp up its pace of rate increases, with the possibility of a further two rate increases in September and December likely to tamp down too-hot growth. That could knock bond prices lower, conversely pushing rates up and pressuring equity markets lower as investors worry about rising borrowing costs. Ultimately, most of the analysis that you are going to hear about this GDP number is a load of nonsense. 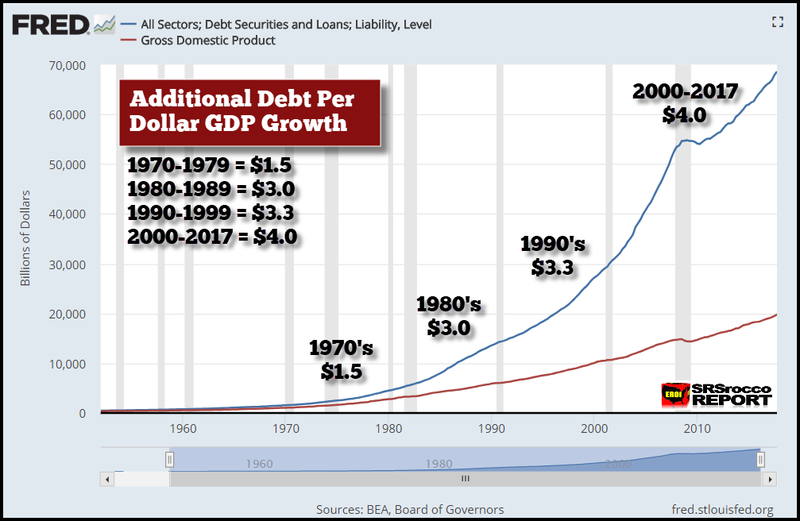 The only reason why the U.S. economy is showing a little bit of growth is because we are on the greatest debt binge in our history. When Donald Trump entered the White House the U.S. government was 19.9 trillion dollars in debt, and now that figure has ballooned to 21.2 trillion dollars in debt. If we had not added 1.3 trillion dollars to the national debt over the past year and a half, there is no way that the economy would be growing right now. And to be honest, it wouldn’t be too difficult to ramp up GDP growth to 10 percent. All we would have to do would be to borrow and spend enough money. So why don’t we do that? Well, it is because we are already on a path to national suicide. It is being projected that our national debt will hit 30 trillion dollars by 2028, and neither the Republicans nor the Democrats seem concerned about doing anything to alter this trajectory. If we do get to 30 trillion dollars in debt and interest rates return to their long-term averages, we will be paying more than 1.5 trillion dollars a year just in interest on the national debt and our nation will be financially destroyed. In Illinois, for instance, vendors wait months to be paid by a government that’s $30 billion in debt, and one whose bonds are just one notch above junk bond status, according to Daniels. New York’s more than $356 billion in debt; New Jersey more than $104 billion; and California more than $428 billion. As I have explained so many times, we are living a debt-fueled standard of living that is way above what we deserve. If we only spent what we had, the economy would immediately plunge into a depression and our standard of living would collapse. The only way to keep the party going is to borrow and spend increasingly larger amounts of money, but everyone knows that this is simply not sustainable. And it isn’t just government debt that is the problem. Since the last financial crisis, corporate debt has doubled. A massive consumer debt binge has pushed credit card debt to an all-time record high, and at this point the average American household is nearly $140,000 in debt. When you add all forms of debt together, Americans are nearly 70 trillion dollars in the hole right now. For much more on all of this, please see my previous article entitled “Why America Is Heading Straight Toward The Worst Debt Crisis In History”. So enjoy the debt-fueled GDP numbers for now, because the truth is that they aren’t going to last for long. Our endless appetite for debt is literally destroying the bright future that our children and our grandchildren were supposed to have, and someday they will look back and curse us for what we have done to their country. Today, America is nearly 70 trillion dollars in debt, and that debt is shooting higher at an exponential rate. Usually most of the focus in on the national debt, which is now 21 trillion dollars and rising, but when you total all forms of debt in our society together it comes to a grand total just short of 70 trillion dollars. Many people seem to believe that the debt imbalances that existed prior to the great financial crisis of 2008 have been solved, but that is not the case at all. 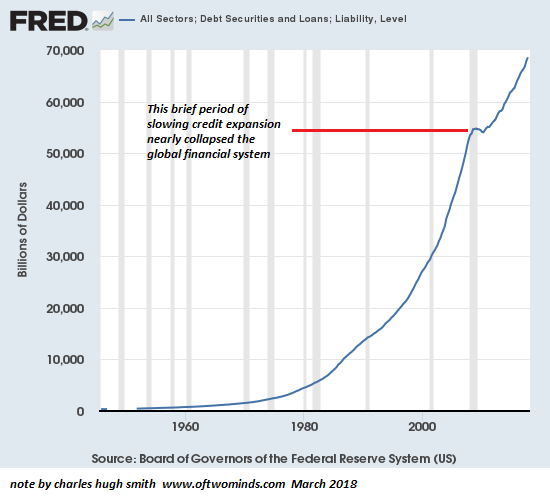 We are living in the terminal phase of the greatest debt bubble in history, and with each passing day that mountain of debt just keeps on getting bigger and bigger. It simply is not mathematically possible for debt to keep on growing at a pace that is many times greater than GDP growth, and at some point this absurd bubble will come to an abrupt end. So those that are forecasting many years of prosperity to come are simply being delusional. Our current standard of living is very heavily fueled by debt, and at some point we are going to hit a wall. Americans are in a borrowing mood, and their total tab for consumer debt could reach a record $4 trillion by the end of 2018. That’s according to LendingTree, a loan comparison website, which analyzed data from the Federal Reserve on nonmortgage debts including credit cards, and auto, personal and student loans. Americans owe more than 26 percent of their annual income to this debt. That’s up from 22 percent in 2010. It’s also higher than debt levels during the mid-2000s when credit availability soared. We have never seen this level of consumer debt before in all of U.S. history. Just a few days ago I wrote about how tens of millions of Americans are living on the edge financially, and this is yet more evidence to back up that claim. Right now, Americans owe more than a trillion dollars on auto loans, and we are clearly in the greatest auto loan debt bubble that we have ever seen. In the first quarter, the delinquency rate on credit-card loan balances at commercial banks other than the largest 100 – so at the 4,788 smaller banks in the US – spiked in to 5.9%. This exceeds the peak during the Financial Crisis. The credit-card charge-off rate at these banks spiked to 8%. This is approaching the peak during the Financial Crisis. 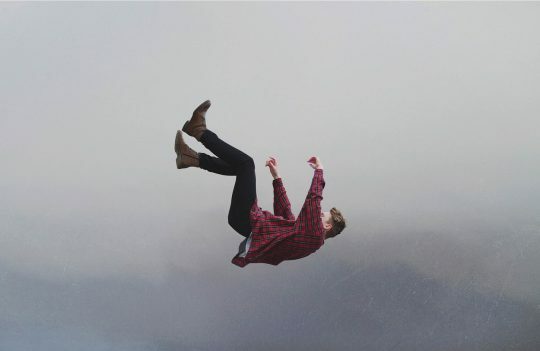 Despite economic and stock market gains over the past nine years, many young adults are still struggling to get ahead in their financial lives and, in some ways, things may have actually gotten worse. Americans age 25 to 34 with college degrees and student debt have a median net wealth of negative $1,900, according to a report analyzing 2016 Federal Reserve data released Thursday by Young Invincibles, a young adult advocacy group. That’s a drop of $9,000 from 2013, YI’s analysis found. Meanwhile, corporate debt has doubled since the last financial crisis. Thousands of companies are so highly leveraged that even a slight economic downturn could completely wipe them out. State and local government debt levels are also at record highs, but nobody seems to care. And if we never have another recession everything might work out okay. The fiscal outlook for the United States “is not good,” according to Goldman Sachs, and could pose a threat to the country’s economic security during the next recession. 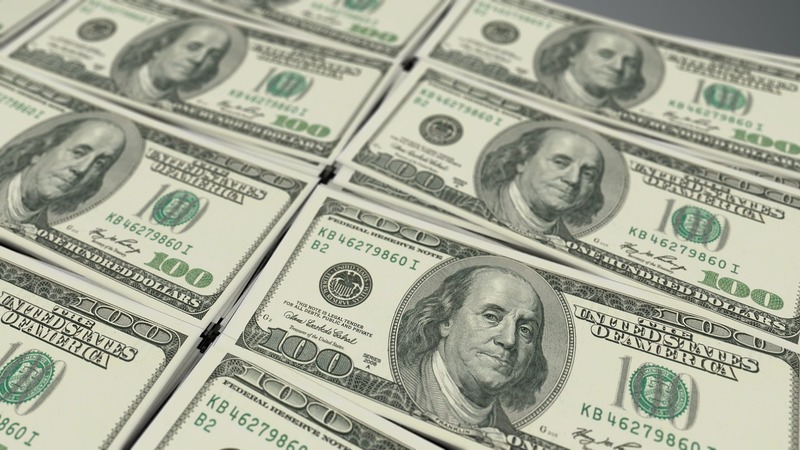 According to forecasts from the bank’s chief economist, the federal deficit will increase from $825 billion (or 4.1 percent of gross domestic product) to $1.25 trillion (5.5 percent of GDP) by 2021. And by 2028, the bank expects the number to balloon to $2.05 trillion (7 percent of GDP). Our national debt has been growing at an exponential rate for decades, and because total disaster has not struck yet many people seem to believe that we can keep on doing this. But the truth is that it simply is not possible. There is only so much debt that a society can take on before the entire system implodes. So how close are we to that point? We are literally on a path to national suicide. Whether it happens next month, next year or five years from now, it is inevitable that we are going to slam into a brick wall of financial reality. For the moment, the only way that we can continue to enjoy our current debt-fueled standard of living is to continue increasing our debt bubble at an exponential rate. But that can only go on for so long, and when the party ends we are going to experience the greatest debt crisis in history. Today, the average American household is nearly $140,000 in debt, and that is more than double median household income. And if we were to include each household’s share of corporate debt, local government debt, state government debt and federal government debt, that number would be many times higher. All of this debt will never be repaid. Ultimately there will come a day when the system will completely collapse under the weight of so much debt, and most Americans are completely unaware that such a day of reckoning is rapidly approaching.